Growing up, George Takei taught me about honor, friendship, and service through his elegant portrayal of Lt. Hikaru Sulu. His rich voice has always had a sense of calm strength that I find inspiring. Last night I had one of the most unique honors of my career. For the first time, however briefly, I had the opportunity to perform for one of the actors who inspired me to pursue theatre and film. 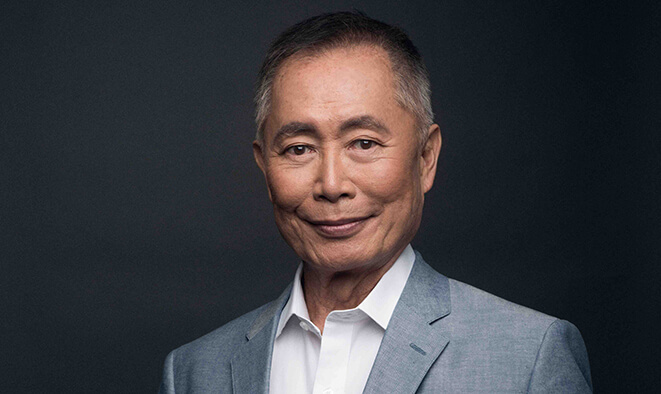 I, along with some amazing Chicago talent, presented three numbers from his Broadway show "Allegiance" as an opening act to his speech in Chicago on the Japanese Incarceration Camps of the Second World War. Playing the various roles of soldier, FBI, and farmer, I portrayed the various ways white Americans criminalized, persecuted, and took advantage of other Americans for no other reason but their race. I was only in the first number, and for the other two, I waited in the wings. Feet away from the living legend that is George Takei. There I was. Mr. Takei sitting feet before me, engrossed in the performance on stage, waiting in the wings with me. Two performers waiting to retake the stage. Equals. Well...except for his police entourage, wealth and fame. Oh how I longed to bend his ear on his experiences on Star Trek (which celebrates it's 51st anniversary today), on being gay in Hollywood, and countless other topics. But it was enough to simply be there. In proximity. After our performance we were invited to hear him speak on his experience as a proud Japanese American in this country. Even with the unthinkable hardship put on his family, his commitment to his country...our country, America, remains true and optimistic. Two comments stuck out to me specifically. The first is that his father, who bore the brunt of the experience for the family, still believed that our system of government is still one of the best in the world because it is of the people. The second was that "We as a democracy have a great capacity to create but as fallible human beings, we can make great mistakes." He also reiterated multiple times that the way to create change is to stay engaged, give of your time, do your homework, and participate as a citizen by making informed, educateddecisions when casting your vote. I didn't get the chance to meet George Takei. There is no selfie, no handshake, no signed action figure. I doubt that I will have this opportunity again and that's okay. Despite my love and appreciation for this man as a Sci-Fi legend, I left with something even better. I left the theatre with hope for our future and pride in our country, both of which have been difficult to muster in recent months. I left inspired to contribute more as a citizen as well as an artist. We are all waiting in the wings, and America is pleading for us to take the stage.